Karen Allen has been a major force in the local music scene for quite some time. Originally the lead vocalist for Crazy Jane, Karen has been a member of Whistlepunk and Tofujitsu, and has performed as the leader of The Wren Allen band. 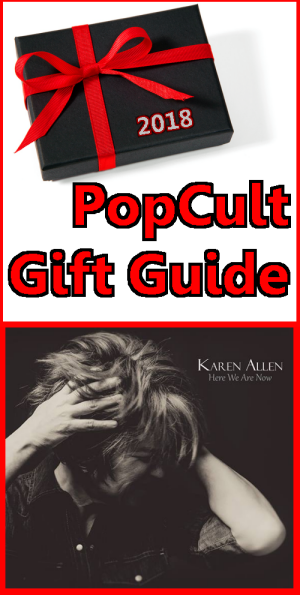 Hot on the heels of the recent Crazy Jane reunion album, Karen has just released an amazing new album, Here We Are Now, that proves she is still at the top of her game as a songwriter and singer. Let’s go to her official bio for more details: “Karen Allen’s upbringing in Point Pleasant, West Virginia has a surprising effect on her life and music. While grounded in country folk and roots rock, Karen gravitates to indie pop, alt rock and experimental sounds. All of these influences fuel a musical landscape for telling her unique story of love, loss, forgiveness, and transcendence. “Karen is best known as the founding member of the alt-grunge band Crazy Jane. The band recorded and toured in support of three albums, performed at the legendary CBGBs (NYC), NPR’s “Mountain Stage”, NXNE Music Festival (Toronto) to name a few and alongside acts such as They Might Be Giants, Violent Femmes, Donna the Buffalo, Julian Lennon, and Robyn Hitchcock. “Deeply affected by the 9/11 tragedy, Karen immersed herself in humanitarian work, becoming a skilled community organizer focused on helping disaster survivors and military members and families affected by war. During that time, Karen also began playing drums and recorded with indie rock duo Tofujitsu and experimental rock trio Fabulous Head. You can order Here We Are Now directly from Karen’s website, or you can check to see if it’s available at local shops like Budget Tapes & Records or Sullivan’s Records.